Information for patients considering an injection medialization procedure into their vocal cords. For Botox injections see the spasmodic dysphonia page. The following is typical for my patients. There certainly are regional and individual surgeon variations in style. Injection medialization laryngoplasty is a procedure that provides support to a vocal fold that lacks either the bulk (such as in vocal fold bowing) or the mobility (such as in paralysis) it once had. Most commonly it is used to try and correct a neurologic injury or muscle weakness problem that prevents full functioning of the vocal fold or folds. Many ENT physicians perform this procedure in the operating room with the patient asleep. I much prefer performing the procedure in the office for the following reasons. When the procedure is done awake, a judgement can be made about how much to inject. The patient can talk during the procedure and benefit can be assessed in real time. If more injection is required, it can be done immediately. The procedure is simpler: there is much less equipment to set up. The risks are fewer. The cost is far less: no operating room fee (and this is usually the largest part of the bill for a surgery) and no anesthesia bill. Injection medialization of the vocal cords may be used for paralysis or atrophy of the vocal cord or cords. The vocal cord may require support if it is paralyzed and/or if it is bowed. Two things happen with a paralysis. The vocal cord is basically a muscle with a mucous membrane covering (the type of skin you would find inside your mouth). When a muscle is no longer hooked up to a nerve, it atrophies or shrinks. Therefore, the paralyzed vocal cord would be small in size and probably bowed. Additionally, depending on the type of paralysis, the vocal cord may not be moving close enough to the middle for the other vocal cord to come together and meet it. If they cannot come together, it is difficult to make a sound or at least a loud sound. So, in some types of vocal cord paralysis, an injection can rebulk up the atrophied vocal cord and move it toward the opposite vocal cord so that they can come together again for speaking. In my hands injections are primarily used for temporary correction of a problem or as a trial to see if increasing the bulk of the vocal fold has the expected effect on improving voice or correcting problems with liquids entering the windpipe or correcting shortness of breath caused by laryngeal incompetence. See the implant section for choices of injection material. Before the surgery/procedure, a PARQ conference is held with you. This is an acronym for Procedures, Alternatives,Risks and Questions. It means that your surgeon has discussed with you in full detail the reasons for the procedure, the alternative treatments to the procedure, the risks of the procedure and that you have been given ample time to ask questions and are satisfied with those reasons and answers. The main risks of the procedure are a less-than-expected beneficial outcome, bleeding, infection, discomfort during the procedure, or breathing difficulties. Injectable collagen may have additional issues since it is a bovine product. Please see McGhan Medical’s discussion. Your body is not a car and we cannot go to the body shop and just put on a brand new fender. The surgeon’s skills, your body’s healing capabilities, tendency to swell, scar and the type of disease present all enter into the equation of that attempted perfect result. Therefore perfection is tempered by the human condition. Still many results are excellent, some are good and rarely the outcome is poor. Your surgeon will likely temper your expectations based on the type of disease being treated as that has a major effect on the expected outcome. With this type of office procedure, a little more injection can always be added to try and approach a best outcome. Too much injection is a little more of a problem depending on the material being injected. Bleeding is a potential risk anytime a needle puncture is made. If you are on any medication that may thin the blood, that would increase the risk, though this procedure has less risk of bleeding than a surgical incision. Examples of medications that might prolong bleeding include Coumadin, aspirin or even vitamin E. You should go over all medications that you take with your physician before surgery. Any time a puncture is made, that becomes a route for bacteria to enter into the body. In this case we are also placing an implant material into body. An antibiotic might be used if there is some reason to suspect an increased risk of infection. Topical anesthesia may be used to prevent gagging or avoid feeling a needle poke into the vocal cords. Some people are such severe gaggers that the procedure may be unpleasant in that respect. Additionally, though the surface of the vocal cords are numb, the pressure that comes during the actual injection is generally felt to some degree. When I ask patients to rate the discomfort of the injection, they have graded it anywhere from a 3 to an 8 on a scale of 10 and they often describe it as a pressure. It is common for the sensation to be felt in the ear or jaw on the same side and that is called a referred sensation. The same nerve supplies the ear and the voice box. Some people appreciate Valium before the procedure. This has occurred very uncommonly in my experience, and much less than it would seem based on logic. The voice box and wind pipe are of a limited size and since this procedure frequently moves one vocal fold to or even across the midline, it may decrease the room to breathe. At times I place enough collagen in a one-sided injection or place bilateral injections in both sides which moves the front half of the vocal folds together, touching even when open. Breathing room remains at the back of the voice box. Then there is almost always some swelling after working on the voicebox. Your surgeon will usually be able to predict the risk based on how much surgery is being done. Most injectable implants are diluted/suspended in some solution to make them injectable. This solution gets absorbed afterwards and so there is usually some attempt to over-inject the vocal cords initially to prepare for this absorption. In essence, a perfect voice at the time of injection will likely be a little less robust as the fluid is absorbed over several days. Medications, particularly steroids, may be given to help decrease swelling if it is significant. Many surgeons only perform this procedure under general anesthesia. I find it more expeditious and get better results performing the procedure in the office. The cost is probably less than a tenth of the cost in the hospital. There are two approaches to injecting a material into the vocal fold in the office: using a curved needle through the mouth or using a short needle directly through the skin and the Adam’s apple. Both procedures are done while monitoring the vocal folds with a laryngoscope on a video monitor. Because of gagging and accurracy issues, I now only perform the procedure transcutaneously. I use a flexible laryngoscope through the nose which has been anesthetized. I numb up the skin over the larynx and squirt the lidocaine into the airway which makes the patient cough. This anesthetizes the inside of the voice box. Typically in men I pass the needle over the top of the Adam's apple (thyroid cartilage) and insert the material into the vocal cord from above. Typically in women I pass the needle under the thyroid cartilage and enter the vocal cords from below. Discomfort is variable. Many people with a paralysis have no sensation because of the nerve injury and may not even feel the injection going in. At the other extreme, some materials are more uncomfortable than others. Some patients have said that at the moment the material is in they describe the pain as a 7/10, which has the injection is stopped is down to about a 2/10. A video covering this and other types of injections is viewable here. Typical choices have included Teflon, Gelfoam, fat, collagen, various gels, hyaluronic acid, or Calcium hydroxylapatite (CaHA), though new products are being developed rather rapidly. Teflon is a permanent type of injection implant material. It has a long term risk of a foreign body reaction (granuloma) which can cause the voice to deteriorate some years later. The body’s reaction to the particulate material causes a hardening and expansion of the implant. For this reason (I have removed a number of Teflon granulomas), I have not used Teflon in many years. I feel there are better options available now. Gelfoam, collagen, CaHA, various gels and perhaps fat are temporary injections that gradually get reabsorbed by the body over time, perhaps 2 - 12 months. I suspect that gelfoam is reabsorbed faster than others. Fat also tends to be variably reabsorbed over time and might even be permanent in some cases. Collagen, hyaluronic acid & CaHA have the benefit that they are more fluid like (suspensions) and can be inserted through a smaller syringe. This allows for an easier injection right through the skin. There are several pre-made products currently available. One has the downside of being a bovine (cow) product so has some risk of an allergic reaction. Cymetra is a product derived from human collagen sources and manufactured by LifeCell Corporation. Cymetra comes in a dried, frozen format that requires reconstitution. I use Lidocaine to dilute it as this preparation seems to be, on occasion, more painful on injection than Zyplast/Zyderm below. However, when the sensory nerve is also injured in the larynx, this seems not to be an issue. It takes more time to prepare the injection and seems nearly impossible to get all of the dried substance rehydrated. On the positive side, is seems to have a lower risk of allergic reactions and seems to last longer than Zyplast/Zyderm in my experience. Depending on how much liquid the physician uses for rehydration, the injection can go easier or more difficult, though at too great a dilution, the reabsorption of the liquid will lead to a less medialized vocal cord. I now use 1.7 cc of 2 percent Lidocaine to rehydrate the 2cc product. In small women, I can get by with one cc, but almost all men require more than one cc of injection, usually 1.2 to 1.7 cc in a thin paralyzed vocal cord. The more I can get in, the longer the injection provides benefit. Even to the point of the vocal cords touching along their anterior half during abduction or breathing in. Usually the voice is much worse for about 6 to 24 hours, being quite strained in quality. Usually it is much better the next day, though there may be some roughness for one to two weeks. (A voice that was fair to good before the injection notices the roughness. A voice that was non-existent or a whisper before the injection seems completely normal). Usually the voice is great for two to three weeks and then some fading starts in terms of volume or durabilty or perhaps in an inability to swallow completely normally. It may improve the voice for many months. A booster or second injection after a month or two, may last even a bit longer before fading. Even when I look at the vocal cord and it is thin again after a month or two, the person is usually doing better than before the injection in terms of vocal volume and durability. Zyderm or Zyplast are bovine (cow) collagen preparations that are used predominately for facial plastic type procedures. They work well in the vocal cords in my experience. The injectible is very smooth and easy to inject. It is stored refigerated. McGhan Pharmaceuticals manufactures the product. I have stopped using this preparation because of the potential risks, though I found it to work very well and had no complications with it. The company doesn't really support its use in the vocal cords. While your own collagen can be made, it is fairly costly, requires a surgical procedure on the patient and you have to give up quite a chunk of skin, so I do not use that product. Calcium hydroxylapatite (abbreviated CaHA) (trade name: Prolaryn Plus) made by Merz Asthetics has the benefit of being FDA approved for use in the vocal cords. It is a newer product and has some theoretical advantages and disadvantages that time will help to solve. There are some suggestions that it may last longer than collagen, though in my experience the durability is highly variable. I have seen it still visible within the vocal cords after two years. I have seen it reabsorb within one month. It seems to depend at what depth it is placed in the vocal cord. The nearer the surface, the longer it stays present. The deeper it is placed, the quicker it reabsorbs. CaHA is a constituent of bone and if the injection was too close to the surface and if it encouraged bone formation, that would be a problem. A company representative has responded that it does not form bone, unless it is placed in contact with bone and that would seem to be born out by at least one radiologic study that show its gradual absorption over time in the vocal cords. The other possibility is that it forms a scaffolding for the body's own tissues to fill in. It has lasted for long periods of time in other areas of the body. It is premixed and very easy to use. Gelfoam in a ground up form that can be rehydrated for injection has been taken off the market because of some manufacturing issues. It is made by Pharmacia Corporation. Though it may someday be back on the market, I have stopped using it as collagen lasts much longer and can be placed much easier. The gelfoam has been thick enough in my experience to require a piston powered syringe (think caulking gun) and thus I used to place it through the mouth - difficult in people with a brisk gag reflex. The trans-cricothyroid membrane collagen injections are much easier and more comfortable to accomplish. Fat is from your own body. It can be placed as a lump through a cut in the vocal cords while you are asleep and sewn shut or it can be injected like gelfoam through a caulking gun-type surgical instrument. This process often kills a percentage of the fat cells and thus my inclusion here in the temporary injectable category. Some people get good results with fat injections, others get poor results. It does also require that you be put to sleep with a general anesthetic in my experience. I do find fat useful for dealing with vocal fold scarring. The temporary effect (three to six months) of these injections can be used to your advantage. If it is likely that the injury to your nerve is temporary and the nerve will recover on its own, you now have two options. You can wait a year with a poor voice, choking on liquids and shortness of breath with exercise or you can have an injection that immediately restores voice and typically improves choking and coughing on liquids as well as improving vocal durability while you wait for your nerve to recover. These injections may be repeated but if the vocal cord does not return to normal in a year, it is unlikely to further recover. A permanent fix may be provided by a medialization laryngoplasty with a solid implant. These ultra-close views demonstrate the atrophy of a left paralysed vocal cord in the left photo. In the second photo a needle (25-guage) has been passed over the thyroid cartilage and into the left vocal cord from above. The needle is presently just lateral to the left vocal process and the collagen is being injected. 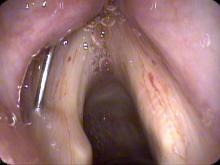 In the next photo, the left vocal cord is now full of collagen and nearly straight along the medial vibratory margin. The patient is now able to close their vocal cords completely. Your voice will often seem a little tight or effortful at the end of the injection. It will likely get worse for a few days to a week until any swelling starts to subside. If the injection is the temporary type then your voice may gradually deteriorate over several months. In my experience it changes over two to six months. If it was done with Teflon, then it should reach a stable condition in about a month. It is reasonable to slightly limit talking for a few days, but otherwise your symptoms should be improved. If you develop swelling or redness of the skin at the injection site or if you feel like you are getting short of breath, you should call your physician immediately.